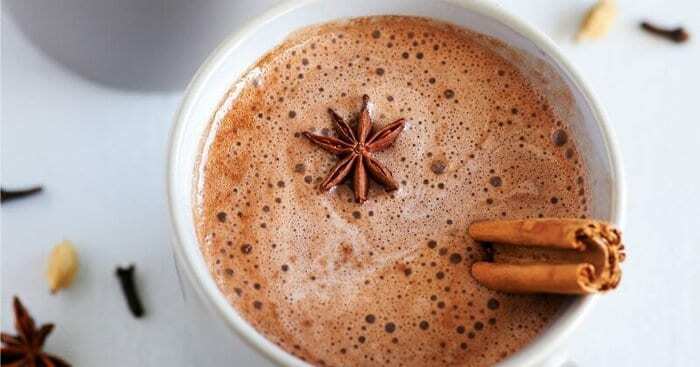 Looking for a caffeine-free alternative to a chai latte? Try this Dandelion Vanilla Chai Latte. It’s easy to make, delicious and really good for you. I LOVE my chai lattes. For years I was hooked on getting them from my local coffee shops, but then realized I was spending way too much money and consuming too much sugar that way. Then I started making chai lattes at home with real food ingredients, such as organic chai tea, raw milk and raw honey. I still enjoy my real food chai lattes a few times a week. But now I’ve got a new favorite drink: My Dandelion Vanilla Chai Latte. Dandelion root is the key to this tea. Yep, those dandelions growing in your garden are actually medicinal herbs – particularly for detoxifying the liver, kidneys, skin and digestive system. Dandelion root is also caffeine free, and tastes a bit like black tea so it’s a great substitute for your favorite tea recipes. 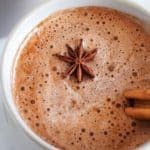 So you can use this recipe with regular black tea to make a traditional chai latte, or use dandelion root for a caffeine-free version that can help to detoxify the body naturally. Did you try this Dandelion Vanilla Chai Recipe? Don’t forget to rate the recipe and comment below to let me know how it went. You can also FOLLOW ME on Facebook, Instagram and Pinterest to see what other fun things I’m getting up to. Looking for a caffeine-free alternative to a chai latte? Try this Dandelion Vanilla Chai Latte. 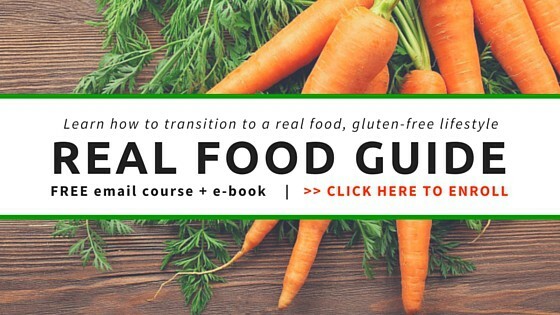 It's easy to make, delicious and really good for you. Use a mortal and pestle to crush cardamom pods. Add cardamom, whole anise, dandelion tea and water to a medium-sized pot and cover. Boil for about 5-6 minutes. Pour liquid into a quart-sized glass jar - straining tea and spices. Pour tea mixture into 4 glass mugs and top with milk of choice. 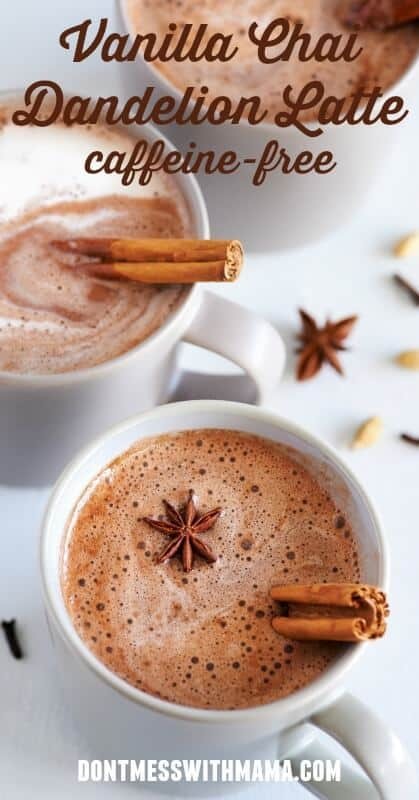 Top off each mug with a small dash of pumpkin pie spice to garnish. I love the sound of dandelion tea bags, definitely going to try them and this latte has my name written all over it, thanks for sharing! Hi there. this is my favorite one. I was wondering I put cinnamon stick and vanilla extract along with other ingredients while I am simmering it.